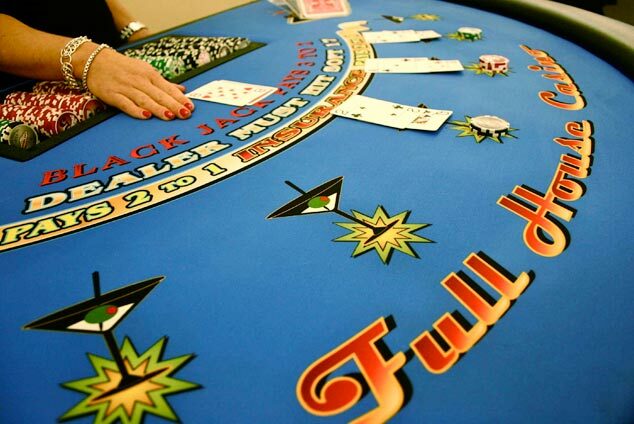 If you are looking to rent casino tables for a party or fundraiser, contact the staff at Full House Casino Events. We are committed to helping you plan the best casino party. Our staff is able to host events in small or large venues and can supply any party with a selection of game tables accompanied by professional dealers. Annually, Full House Casino is involved in hundreds of parties across the country with a variety of clients in cities like Los Angeles, San Francisco, Houston, or New York. Checkout our game tables and see that competitors’ cannot compare their merchandise with our’s. 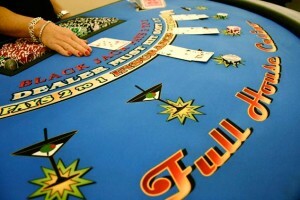 Checkout Full House Casino’s Texas Hold’em style poker table Rentals. Contact our staff to rent one of our premier poker tables in Los Angeles, San Francisco, Houston, or New York. Rent top-quality roulette tables from Full House Casino and play on the same tables selected for the 2014 Superbowl Party in New York City. Our roulette tables are custom designed and crowned with beautiful mahogany wheels. Try your luck out on one of Full House Casino’s full size craps table. Rent the best for your casino party guests. Feeling lucky enough to let the money wheel decide whether you win or loose? If so, checkout Full House Casino’s money wheel. Three card poker combines the speed of other casino games like craps with the excitement of poker. Contact the specialist at Full House Casino to rent this casino table today. Would you want this at your casino party? Casino tables make a great addition to any party. Your guests can have fun while socializing with each other. So, is it important to have the same casino table brand at a party? Why do you need to rent the best quality tables? Does it make a difference ? It actually matters more than event organizers think. 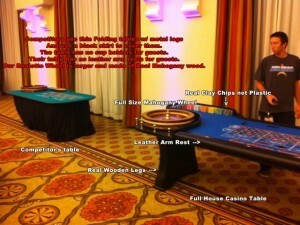 Guests like professional casino rental equipment. No one wants guests complaining about the quality of the table they are playing on. Organizers do not want to appease dissatisfied sponsors. So if planners want guests to have a memorable experience, they should rent the best. It may not seem to make a difference but creating an authentic atmosphere takes a lot of effort. Small details like using professional cards made with high grade cellulose acetate plastic, not cheap paper, matters. Dealers will not be shuffling cards incorrectly or bending decks till they tear. Using real wooden chips, instead of cheap plastic ones, gives players the feel of playing at a real casino. This is why renting professional equipment is better than cheap popup tables. It makes guests feel like they are really getting the full experience! So instead of renting cheap knockoffs or using a company that outsources its jobs to a low quality service, contact Full House Casino Events. When you play on our tables it will feel like a real Las Vegas casino. Guests are able to comfortably play without worrying about cards bending, drinks spilling, or inexperienced dealers. Each table adorns our unique company logo and is custom built with the same materials you find at a real casino. Rather than rent tables from a poorly managed company, choose a company whose employees are knowledgeable about casino equipment and will take the time to teach beginners how to play. You want dealers who are friendly and can easily interact with guests at any casino event. At Full House Casino Events, we are proud to supply clients with the highest quality casino tables available for rent. Don’t gamble with other rentals services that claim to have great tables or experienced dealers. Go with the experts and choose the company who cares about their appearance and won’t cut corners.